Meetings will resume as normal on Friday 8th January. Our annual Christmas meal will be taking place on Thursday 10th December at 12:00 noon. The venue will again be the Orme View Restaurant at Llandrillo College. If you have not booked your place yet but would like to attend you will need to be quick and contact David Bird ASAP. Please note that due to the Christmas dinner taking place next Thursday 10th Dec, there will be no meeting of the photo group this week. Keep your eye on the noticeboard at Pentre Newydd where any updates to this list will be posted. Some of our members enjoying their Monday morning cooking lesson courtesy of Communities First. A number of members have been benefiting from some free Facebook training on Wednesday mornings, courtesy of CVSC. This is a three to four week course with the next one due to start in the New Year on Jan 6th. If you would like to put your name down please let us know so your name can be added to the list. Activities at Rhiw Road are continuing apace and we now have a fully equipped woodworking workshop having just purchased a brand new Jet lathe. The wood turning is proving extremely popular and we may soon need another lathe if the interest continues. Monday afternoons still sees the Ukulele Group singing their hearts out. We have recently played at a number of venues with more planned before Christmas (including at our own Christmas Meal at the Orme View). Thursday morning is the Digital Photography group and there is plenty of room for more members to join this group. If you are interested, just turn up on Thursdays at 10:00am (not this Thursday though because of the Christmas Meal). Norman, our Treasurer, has won another cup for his woodturning, this time at the Llandegai club, so congratulations to Norman - again. Saturday 10th October saw the very first ShedFest in north Wales with members from across the region coming together for what turned out to be a fantastic day. Hosted by the guys from the Denbigh Shed, it was a great opportunity to meet people from other sheds and even included entertainment from the award winning Colwyn Shedders Ukulele Band. Thursday 10:00am until 12:00 noon Digital Photography workshop (please note that the Thursday meeting is cancelled this week only as Alan Foulkes has the flu and other members are attending the Llanrwst shed opening). We also have our 2nd Xmas dinner on Thursday 10th December at Llandrillo College. This was a real blast last year and promises to be bigger and better this year. Please speak to Committee Member, David Bird to book you place. If you have yet to visit us in Colwyn Bay then there has never been a better time than the present. These are exiting times for Men's Sheds in north Wales generally and Colwyn Bay in particular and I look forward to the future with relish..! 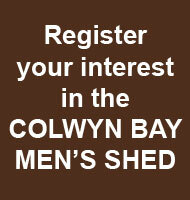 I am sure you are aware of all that's been going on at Colwyn Bay Men's Shed recently, especially if you've been reading the local press. As you may know our new premises on Rhiw Road were opened on 11 June 2015 by the Minister for Communities and Tackling Poverty, Lesley Griffiths AM. Also present at the opening was Mayor of Colwyn Bay Cllr Sibani Roy plus representatives from the Town Council, CVSC and Cartrefi Conwy, who have all been an enormous help to our group. Of course, we mustn't forget all our members who attended the event together with wives and partners. It was a turning point in our short history and the start of exciting times ahead. Only Four Days To Go..! Just a quick reminder that there are only four days to go before the voting for this community fund grant from Aviva closes. I am sure you will agree, with £5,000 up for grabs we really don't want to miss this opportunity. Unfortunately we have so far only received 566 votes up to tonight so we need to have another push to get this number much higher. If clicking the link doesn't work for you just copy and paste the whole link into the address bar of your browser. You can also click the image above. If you have voted but still have votes left, there is still time to use the remainder for our project. I would like to thank you for your continued support of Colwyn Bay Men's Shed, which is going from strength to strength. Our new workshop will be open for use in early June so stay tuned for updates in the next couple of weeks. You can help us to raise funds by simply going to the Aviva webpage and voting for us. You will need to register but this is a simple process which takes just a couple of minutes and really would be appreciated. There's £2,500 up for grabs for use in our local community so please share this with everyone you know. Get your friends and family involved too, forward this email to everyone you know. It doesn't matter where in the country they live, they can still vote for Colwyn Bay Mens Shed. Watch this space for an email announcing the much anticipated opening of our new workshop. Fancy getting your hands dirty? We have acquired some free wood (see photos below) but it has quite a few nails, screws and other bits of metal in it that need to be removed before we can put it to good use. If you can help, please contact me to make arrangements.